Richa Graphics teamed up with prominent national multi-family developers Proffitt Dixon Partners and Jones Lang LaSalle to design, fabricate and install signage at Presley Uptown, an urban modern luxury apartment community situated on the edge of burgeoning Uptown Charlotte and the historic Dilworth neighborhood (in Charlotte, NC). 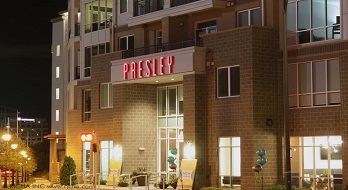 The Presley identity is defined as clean, upscale and modern. All branding for the project was designed with these principles in mind, drawing heavily from the interior design package (developed by Vignette Interior Design, based in Charlotte, NC). Signage was simple, relying on dark stained Walnut natural wood and clean fonts. Additionally, some signs were accented with brushed aluminum plates. The exterior package aimed to complement the building exterior finishes and stake a strong identity, defining what “Presley” represents: clean, upscal and modern. Exterior signage included a dynamically lit RGB LED Marquee sign at the building entrance, an illuminated push-through pan sign below the pool deck, a lit tombstone sign at the resident garage entrance and an illuminated blade sign at the visitor garage entrance. Please review our Presley Portfolio to get a more detailed view of the project.